The Algerian flag was officially adopted on July 3, 1963.It is a flag that marks the independence of Algeria from France and releases it of its status as a French colony. It is the symbol of national sovereignty. It is composed of a red crescent and a star in the middle. The background of the flag is divided in two: the left side of the flag is green, the right side is white. 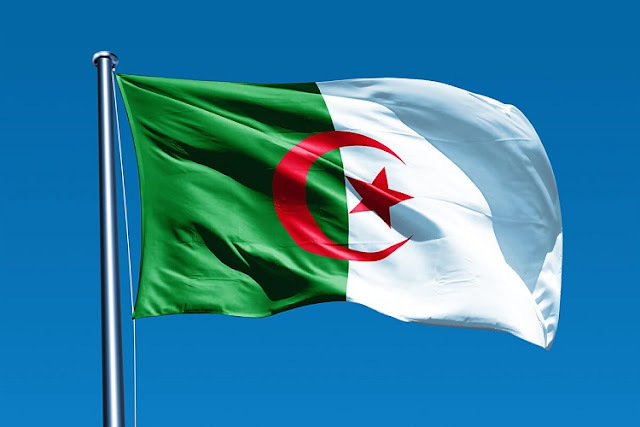 The white of the Algerian flag represents purity, peace and freedom while the green, the crescent and the five-pointed star are representative elements of Islam. Its origin is controversial. According to some resources, it was the Emir Abd-el-Kader who led the forces of liberation against France would be the founder of the flag of Algeria. Other historical research by Algerian historian Yahia says that it was Emilie Busquant, the wife of Messali El Hadj, who designed the final form of the current Algerian flag but that the colors and layout of the flag were fixed previously in 1934, during a meeting of the North African Star (ENA), in 1934, with the militant Benachenhou Hocine, that are chosen the colors of the flag and that Emilie Busquant is then in charge of its making. She sews the flag of the ENA which is an association founded in France by a core of emigrant workers mainly from Algeria, and which initiated the appointment of a working group, whose mission is the realization of the Algerian flag. The main member of ENA was Messali Hadj. After the dissolution of ENA, it became a flag of PPA (Algerian People's Party) that is created by Messali El Hadj. It was in Setif on 8 May 1945 that the Algerian flag, in its present form, made its appearance during the demonstrations. During these events, it is carried by Saal Bouzid, a student who is then assassinated by the French police. The current flag is adopted in 1958 by the Provisional Government of the Algerian Republic (GPRA). It is hoisted at the Monrovia conference (in which the GPRA participates) in August 1959, where it is officially recognized by several African countries. It is subsequently formalized and standardized by the Algerian State according to the law of 25 April 1963.